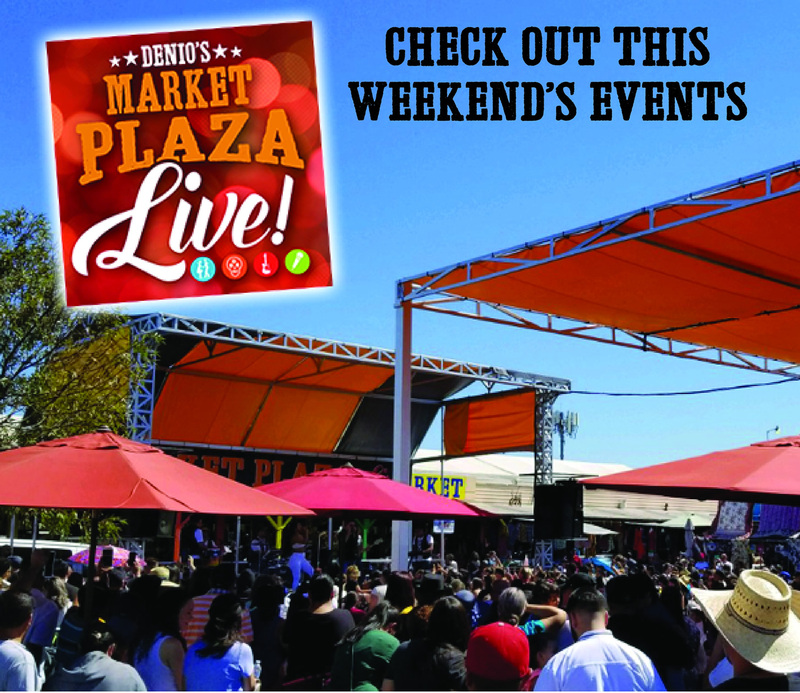 Events – Market Plaza Live! Shopping at Denio’s can be fun, exciting, and save you money! For 70 years now, people from all walks of life have been buying produce, new and used merchandise, antiques, specialty items, and who knows what else! Many of our vendors have been with us for years and have raised their families while selling at Denio’s. Our customers regularly comment on the variety and selection of goods that are presented for sale each weekend. Always the freshest, most abundant selection of produce available anywhere, our produce market continues to be second to none! New and used goods dot the entire market and provide “the thrill of discovery” in looking for that unique “bargain” or “just right” item that keeps people coming back. We love all Pets! However, Denio’s is not the place for them. Dogs that are small enough to be held or pushed in a wagon are welcome. Occasionally we get people that bring their big dogs on a leash, but please leave them at home. The pavement is not healthy for their paws, it gets very hot and the walkways are driven on regularly by vehicles and leaves an unhealthy residue. Service animals assisting you are always welcome! All service animals should be easily identified (via a vest, harness, or tags). Animals should never be left unattended in vehicles. Denio’s is spread over almost 70 acres so it’s easy to get turned around or even separated. We suggest groups plan ahead. Does everyone know where the car is parked? Do you have each other’s cell phone numbers, just in case? Some groups use walkie-talkies, how about you? Remember to bring your shopping cart. How about a wagon, to pull around that “tuckered out” young one? Pre-designate a place to meet up. On Saturday and Sunday parking is only $4, there are no return privileges. Parking is always FREE on Fridays! If you do not park in our parking lot, there is a $2 walk-in fee for everyone 12 years old and up. This walk-in fee does not apply to those who park in our parking lot. We have plenty of spaces available for persons with disabilities. But remember, official unexpired placards or license plates must be visible. Motorcycle parking spaces are also available. While our lots are monitored, please be responsible, lock your vehicle, and do not leave valuables where others can see them. Bargains! Bargains! Bargains! Many of our vendors welcome “haggling” or negotiating a price. Others may have a set selling price. But, it never hurts to ask. Denio’s does not set selling prices, refund and/or exchange policies, so if you are not sure of the vendor’s policy, make sure you ask before you purchase. Need a receipt? Ask the vendor. You just never know! What you see today, you may not see tomorrow, so don’t pass up the deals! Be sure to bring something to carry your purchases in, like a shopping bag, cart, or small wagon. For larger purchases, be prepared to move your purchase to your vehicle. Some vendors have equipment to assist you, but many do not. Please keep in mind, Denio’s does not provide this service. If you have a question, please call in advance. Dress casually, comfortably, and according to the season. Denio’s is open all year, rain or shine! Wear good, comfortable walking shoes. In warm weather, wear a hat and sunglasses and don’t forget your sun block. And, if you’re okay with a little cold or wet weather; hats, gloves, scarves, and ear muffs are a big hit. The temperature changes as the day goes on; we suggest you wear clothing in layers so that you can adjust accordingly. Outer clothing that is offensive, consisting of but not limited to: words/pictures/symbols of a profane, pornographic nature or clothing depicting or related to “gang” activity is not acceptable and will not be permitted on our grounds. Persons choosing to wear this type of clothing at Denio’s will be asked to cover it completely, change into more appropriate attire, or leave the market. Clothing of this style is not conducive to our family friendly atmosphere. Please consider the needs of those in your party, young and young-at-heart, when it comes to the weather and lots of walking. We encourage you to take a little break, Denio’s has many seating areas, some covered, some uncovered. And, when the heat is on, you can enjoy our misters located throughout the selling yard. We take the safety and comfort of our guests and visitors very seriously, especially those little ones. All of Denio’s employees working outdoors wear either bright yellow or blue Denio’s vests and carry radios. Additionally, some carry cell phones for assistance. Parents, please teach your younger ones to find a yellow or blue vest if they can’t find you. Also, take note of how your children are dressed so you can provide us with their description should you get separated. Parents who are separated from their children will want to contact any Denio’s employee or call our Rental Office at (916) 782-2704. One of our team members or management personnel will respond to your location immediately. Children are usually fairly close by so it’s better to stay put. We encourage all parties to make plans to meet up at a set location should anyone in the party become separated. The windmill at the edge of the parking lot is highly visible, a great place to meet up. Or, our Rental Office is centrally located in the yard, just look for the two-story metal building on the north side, along Vineyard Road. It’s also a great location to meet-up. • A Denio’s Team Member can contact the Rental Office by radio. • Contact our Rental Office at (916) 782-2704. We will have someone respond to your location to pick the item up. • If you are near the Rental Office, please turn it in to lost and found. The Rental Office is open Fri 8a-4p, Sat 7:30a-3:30p, Sun 7:30a-4:30p. • Any Denio’s employee in a yellow or blue vest can assist by making radio contact with appropriate personnel. We have six ATMs in convenient locations throughout the market. During the busiest times of the day, there could be a line. Can you carry this for me? Although Denio’s does not provide loading or moving services for those items you have purchased, we do provide loading zones. There are ample loading zone areas available where the selling yard meets the parking lot. If you have any questions, please find and ask someone in a yellow or blue Denio’s vest. Loading zones are for the convenience of all shoppers, please be courteous and be aware. Loading zones are limited to a 10 minute time frame and are also posted tow away zones should you choose to park for an extended time period. One of our parking lots is located at the corner of Atkinson Street & Church Street, adjacent to Denio’s (Lot 5). Any person parked in that lot may request a vehicle transfer to the main lot for the purposes of picking up larger purchases. Simply stop by the ticket booth as you exit Lot 5 and request a transfer from the parking booth attendant. The attendant will notify the main lot of your vehicle description, after which you can proceed to the main lot. Upon reaching the ticket booths for the main lot, let them know you are a transfer. Once the transfer is confirmed, you will be allowed to enter. Parking lot transfers are designed for immediate use only. Denio’s has a No Return Privileges policy on Saturday and Sunday. Where can I test this? Many vendors provide generators or other means of testing electrical appliances, tools, or equipment you may be considering for purchase. Denio’s also provides electrical testing outlets at four convenient locations. Our team will be happy to direct you to the nearest location. Perhaps your question is not about an electrical appliance, but rather about testing out a bicycle, scooter, or mini-bike. For safety purposes, Denio’s does not allow testing and/or demonstration of these or similar types of items in our facility, including our parking lot. We’re Open Rain or Shine! The entire market is open throughout the year! (Our Friday Market is about 1/3 the size of our regular Saturday/Sunday Market. Like our Saturday/Sunday vendors, our Friday Market vendors offer a nice selection of fresh produce as well as a wide variety of new and used merchandise! Subscribe to our monthly e-newsletter.